The agenda includes new information on plenary sessions, panel sessions, speakers, and more. You’ll see that we’ve consolidated our 13 tracks into four pillars covering all facets of the medtech landscape in an effort to streamline our programming, but don’t worry - you can still easily find the content best suited to you by sorting the agenda by one of our 16 audience types in the top right corner. We are also expanding the conference programming to include sessions on global health, digital medtech, and more. We are also very pleased to share that Regina E. Dugan, Vice President of Engineering, Building 8, Facebook will be taking the plenary stage on Tuesday at The MedTech Conference. With her background in leading innovative organizations including Facebook, Google, Motorola Mobility and the Defense Advanced Research Projects Agency (DARPA) to develop breakthrough products that shape the world we live in, Regina E. Dugan's insights are especially relevant as the medtech industry focuses on the intersection of innovative technologies and health care for the future. 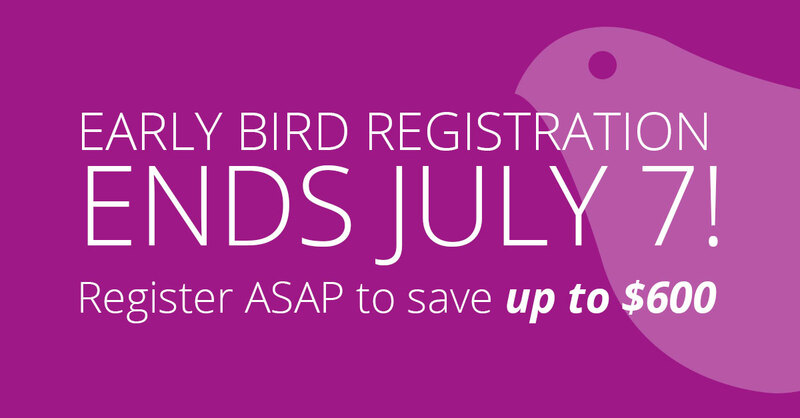 With only a few more days before Friday’s early bird registration deadline, time is running out to register and save up to $600! Registration forms must be received (or postmarked if mailed) by Friday, July 7 in order to qualify for the early rate, and you can also register here.